Back in 2012, the VAG group launched their MQB-chassis cars to the world in the form of the MK7 Golf, SEAT Leon MK3 and Skoda Octavia MK3. These cars featured a steel crossmember on the front of the cars. 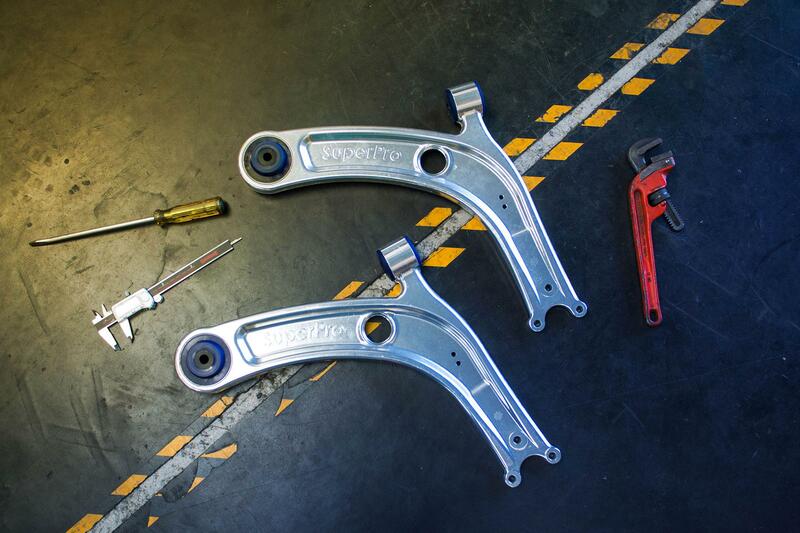 Very shortly after the MQB cars hit the market, SuperPro created a lightweight alloy control arm which offered increased strength, increased caster, increased camber and much longer service life than the standard factory arms. With the launch of the Audi A3 MQB and the MK7.5 Golf, came a change to the chassis in the form of a new alloy crossmember. Quick to react to this change, SuperPro have now created a revised alloy control arm (part number ALOY0018K) which offers all the same benefits as mentioned previously but fits all MQB-chassis vehicles (regardless of whether it's the earlier steel crossmember or newer alloy crossmember). This greatly simplifies the parts required to cover a huge range of VAG vehicles. Exclusive to SuperPro, their alloy arms feature DuroBall rear bushings which is a spherical joint embedded in the firm's unique Polyurethane for incredible control without introducing noise, vibration or harshness. SuperPro's alloy arms are 38% lighter than OEM steel arms and are available to purchase now from your nearest SuperPro stockist.